We had a great day on the photowalk today. About 15 people showed up. Got some fun surfing photos, plus others. Thomas started shooting before 6 a.m. and we stayed at it until 3 p.m. I figure 50 gigs of photos were taken, I can tell everyone is working on processing their stuff cause the Flickr stream for Photowalking8 is seeing a bunch of additions in the past few minutes and Thomas Hawk hasn’t gotten much of his stuff up yet. Tomorrow I’ll try to link to the best. UPDATE: Thomas Hawk is uploading his photos to his Zooomr account here. Oh, and Thomas let me use his camera to take a few shots. Here’s one, titled “fatherhood” that I shot that’s already gotten a few favorites. It’s a real thrill to see a photo of mine among Thomas’ photos. 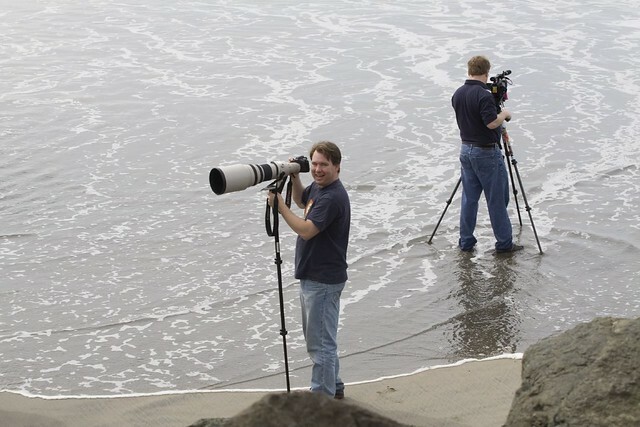 What a lens? What lens? Navneet, Matt’s stuff is amazing and great. He’s only 16 years old and is already doing some fantastic work. This is our second photowalk that he came out on. He shot the last one that Eddie Codel filmed in Chinatown. Tom, we definitely talk about the gear on the show. You’ll see more when it comes out. We also played around with a Canon 1.4 extender on it as well. This gave us an effective reach of 840mm for a lot of the shots. Here’s another shot that Alan took of it as well. Robert that’s a beautiful picture! Looks like you just may have something to fall back on in case this whole tech coverage thing doesn’t pan out! That, or test driving cars. A tip to the Zoomr team: The Zoomr logo looks like a flag though. I would suggest changing it. Thanks Robert and Thomas for a terrific day! It was a real treat to shoot such a massive lens. But the best treat was getting to meet and mingle with a great group of talented photographers! Thanks to both Robert and Thomas for putting together a great photo-walk. I could not help but notice (with much envy) the 600mm you re-named, “The Beast”. Some day I will add one to my the Canon, but for now, I an curious as to how it handled with just a Monopod as opposed to a tripod. Great images and thank you for sharing. for now, I an curious as to how it handled with just a Monopod as opposed to a tripod. Hey Allan, the lens handled beautifully on the monopod. Robert has a really high quality Bogen monopod which made a big difference, but the lens was very doable for me on the monopod. You absolutely must have a monopod or tripod for this lens though. There is simply no other way to shoot it for long periods of time. The lens itself has a nice feature where you can rotate your camera for portrait or landscape perspective with lens itelf (the camera rotates with the lens still attached). It really was a delight to shoot. Thanks to Robert & Thomas for accomodating us into your photowalking8. I cant wait for #9. Pingback: Bill’s Blog » Blog Archive » Who is Thomas Hawk?